So where is Iran's billions of petro Dollars gone to? What happened to all the promises in the beginning of the revolution? The free housing, free telephones, free electricity, free water etc. we were promised? After thirty years of Islamic revolution, it is hard to write down even a short list of 'What the Iranian people have gained from the 1979 revolution?'. One thing is for sure though, some in Lebanon have gained massive benefits from Iran's billions of petro Dollars. Only on Thursday, the Iranian Reconstruction HQ announced it will rebuild nine bridges that were destroyed in Lebanon by the Israelis, and this is just pocket money spending compared to what the Iranian regime has spent in Lebanon alone. 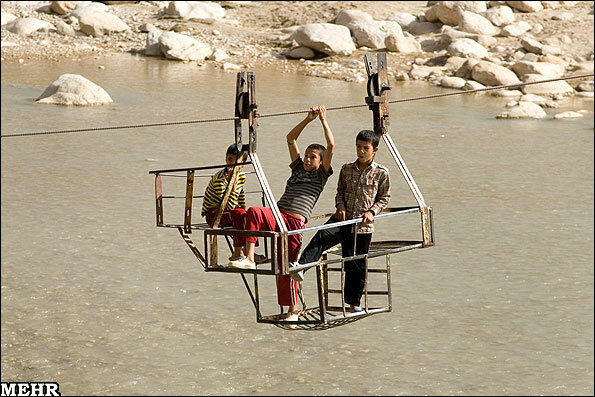 There is no such chance of building a bridge for the Iranian villagers living in Gavdaneh however. Their own water is not drinkable, to bring drinking water to their homes they have to go to their nearest villages. 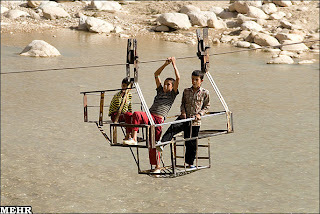 To do this they have to cross a river and the only way they can cross is via this makeshift tele-cabin which they operate manually by pulling on the steel wire rope above them. Almost all the villagers at some point have lost a finger in the accidents that have resulted from this perilous crossing. It seems the authorities in Iran are happy to see Iranians lose their fingers so that the Lebanese can wave at Ahmadinejad with their fiver fingers. As far your inane propaganda goes, this is *really* low - exploiting the case of one village in one of the remotest parts of Iran to make a cheap political point: Have you no shame at all? The fact is that Iran has climbed 40 places in the Human development index rankings since the Revolution. It is now 13 places higher than secular Turkey in terms of health, education and access to utilities like water & electricity, as well as national income. Iran has a duty to help support the oppressed people of Lebanon, Palestine and Afghanistan. Many of these people had their homes completely destroyed. The people of Gavdaneh need help too but they have just not made their case heard. Thankfully Mehr News is doing this now and the government will pay attention to this unique case from Kohgiluyeh va Boyerahmad. Actually the first duty of this current regime should be in building the bridges to regain the trust of the Iranian people! But instead of that, it's greedy and fearful wrong-doing just gets better and better at building higher walls and deeper pits! Assuming Ahmandinejad survives his questionable term, then what next for the Iranian elections eh? I'll tell you what. It'll be a repeat job of what just recently happened in Myranmar. Whereby the military wins under the pretext of low turn-out democracy and even more quickly rubber-stamped by Khamanei or his hangman's successor! Finally, The fully fledged Police-State reigns supreme! Instead of the cancerous erosion it is currently conducting upon the Iranian people now! Reza, you do realise how ridiculous your propaganda accusation sounds, right? If this is propaganda, then what do you call your headlines on Press TV? That's right, your Hojjatieh sect endorse propaganda, lies and violence for the sake of the "greater good". As usual you smack of hypocrisy. The Iranian public's ingenuity, entrepreneurship, hard work and steadfast resilience has seen them ward off their governments mismanagement for too long now. They should be flourishing, instead they are stiffled. Once again their futures are jeopardised and blighted by this current junta's commitment to peripheral "causes". Apparently, sending animals to space and building bridges in Lebanon is more important than building bridges with the Iranian people and investing in IRAN itself. Iran has to have a space agency and a nuclear program. It is about national pride and achievement. Likewise, Iran has to invest in its neighbors to secure its vital interests, influence and security. The fact is that in the past 5 years more villages in Iran have had money pumped into their development projects than ever before. Of course, in the more remote parts (like K&B) there will be a few settlements in urgent need of attention - that is to be expected. You really are Poktin's superfan. I agree with what you have to say, seriously. But let's face it, this is propaganda a la Potkin Azarmehr. There are better ways to highlight the corruption and waywardness of the IRI without alienating one's sense of the truth. A story like this only appeals to the waybecs and winstons of the world and, in fact, gives more ammunition to the Rezas of the world. This is a story for those who will swallow any kind of negativity toward the IRI. Well in places where freedom of speech and criticism gets twisted to be called either 'subversion' or 'sedition', I can certainly take any crisicism on the chin. If I'm a 'superfan' of anything, then it's against those who willingly become the 'office wallers' to those wishing to crush the rights of others! And although yes - some columns here may not always reflect the weighty issues of the day, I suspect it's because they are more than heavily covered by others elsewhere? Some may argue about how the dots are joined up, but if analogies and valid points are made out of truths, then it's obviously another way to stir debate. And debate is also an essential key to a healthy society isn't it..? Debates within a democracy at least vents the people's volcano. But trying to put a cap on it or just ignoring the seismograph of opinion, ultimately just brings the lava flames crashing right up to burn those who thought they were bigger than a mountain!